Becoming Rosie / Devenir Rosie, my non-fiction comic examining Rosie the Riveter and performative gender, is on display at Une BD Si Je Veux, Quand Je Veux! (A Comic Book If I Want, When i Want! ), a show that brings together the works of 25 women from around the world, who use comics to talk about feminism. Organized by Maison Fumetti, the exhibition opens on Saturday (Feb 3) in Nantes, France and is open through April 14. Aritsts in Une BD Si Je Veux, Quand Je Veux! are Pénélope Bagieu, Joris Bas, Alison Bechdel, Catel, Leela Corman, Chicks on Comics, Jacky Fleming, Gauthier, Nanna Johansson, Shreyas R. Krishnan, Oriane Lassus, Victoria Lomasko, Ulli Lust, Mirion Malle, Lisa Mandel, Thomas Mathieu, Delphine Panique, Power Paola, Liv Strömquist, Chloé Wary. Becoming Rosie: Rosie the Riveter and performative gender, my first essay-comic exploring gender and visual culture, is now available in FRENCH! Devenir Rosie: Rosie la Riveteuse et la performativité du genre is published by Éditions Cambourakis, and translated from my English text by Amandine Schneider-Depouhon. Behind the scenes and process for my most recent comic Maqsood-i-Kainaat, for Czap Books and Grindstone Comics' Ley Lines series. Music Directed by Shani Arshad Produced by Strings. Buy a copy of Maqsood-i-Kainaat here. A year into teaching illustration for graduates (in my MFA Illustration Practice elective Drawing Non-fiction) and undergraduates, this is a question that I have recently been thinking more of, and often bring up in class. As a designer and illustrator, my approach to building narratives has always been informed by the idea that there is never one story. My work as a narrator, is to understand the content I am using from multiple perspectives, not just mine, or my client's. I have to be objective. I was taught that in my first year of design school, as part of sensitization before travelling to document life in a village in Central India. Whose truth, was the question we were told to ask ourselves. If there is no single story, can there be a truth? And if truths are subjective, is it possible to truly be objective when trying to narrate them? At an SPX '16 panel discussion with Joe Sacco and Sarah Glidden (moderated by Matt Bors), Sacco responded to the question 'why is journalistic objectivity important in comics? ', by saying being objective was not the same as being honest. Glidden echoed that idea when she said honesty in presenting a story was essential to her, especially when she was skeptical about the information she received from people. There are so many steps between a moment happening, and its telling. As 'objective' narrators, we are also one of many filters, even if we choose to present everything exactly as we think they are before us. Stories and narratives have the power to disenfranchise and also rebuild. As designers and illustrators, we are narrators who wield that power. History is not absolute; it is a record that is made by someone. ‘Past’ isn’t a finite amount of time, it grows in size each day with what people record, document and narrate of places, cultures and each other. In conversation with Nooreen Reza from Kajal Mag, on Rosie the Riveter, Kali, Mother India, and performative gender. For the closing reception of Front Room: Guerrilla Girls at the Baltimore Museum of Art, founding member of the Guerrilla Girls, Frida Kahlo gave an artist talk. 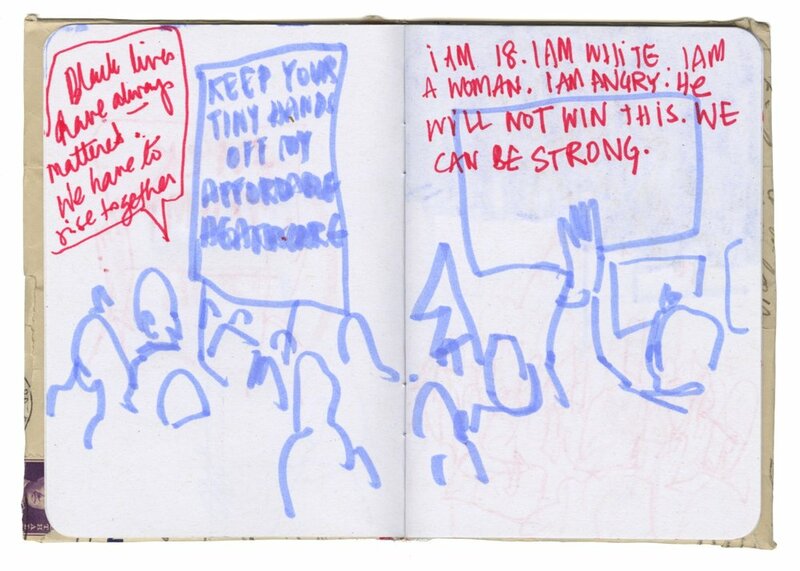 I was at the BMA, with a sketchbook I made for this occasion, ready to draw my way through the talk. The Lookout Journal featured this sketchbook in its entirety soon after the talk. The lovely ladies behind The Lookout Journal did a short feature on my 36 Days of Vowels project and why I did it. On election day, I fell asleep by midnight out of exhaustion. Physical tiredness from a long day of work and teaching, and anxiety from constantly refreshing election results on my phone, feeling everything from this campaign, and my memories of the Indian election in 2014. I fell asleep hoping that I would wake up to better news. That this would not be like every other instance of the world moving so far right this year. Drawing and writing are my way of processing the world around me. On Wednesday morning, I felt paralyzed, unable to make, write or draw. I felt afraid to leave my apartment. I felt my brown-ness and my woman-ness more than ever. I spent the day talking to students, colleagues, friends, trying to comfort each other with hugs and words. Feeling, is overwhelming sometimes; I broke down at the end of the day. Nothing ever comes from complacency and inaction though. I have realized recently, that my physical voice and my ability to make are inextricably connected. If I didn't start making something soon, I would wallow in silence and anger. Baltimore was protesting on Thursday, I was determined to participate, surround myself with many voices, and draw. By the time we made our way from North Charles street to Inner Harbor, I'd filled up a notebook. Drawing while walking the length of the protest, under street lamps, helicopter spotlights, flashing police lights, surrounded by chanting voices, was strangely helpful. I ran into a friend, who had posted this 15 part Instagram post online earlier in the day. She asked me how I was dealing with making as a way to respond. We spoke about needing to not wait for the perfect combination of words or lines to materialize, not trying to be clever. Giving ourselves permission to find a way by drawing, rather than viewing it as a destination. Drawing is re-living something. How do we find a way to draw, without normalizing all the things that need to be resisted in the first place? 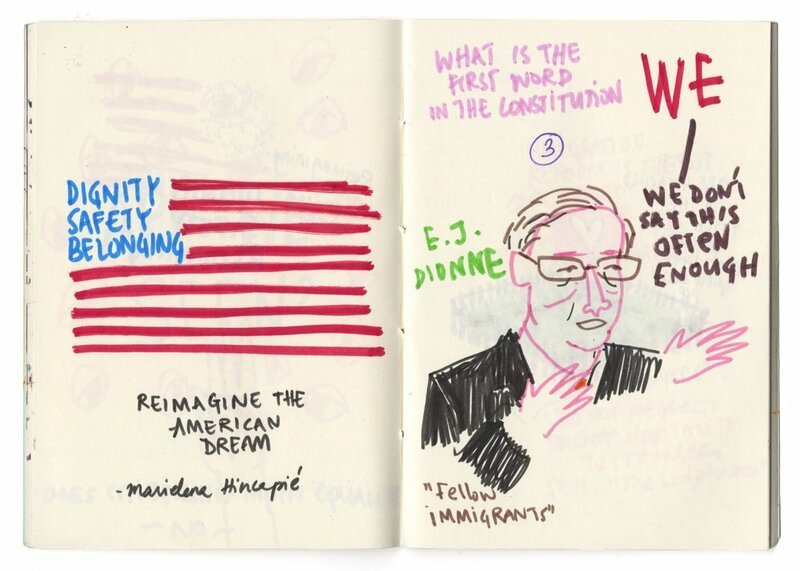 This year's Constitution Day at MICA, Immigration, Racism, and the Changing Face of the Nation, examined the idea of what it means to be American. Panelists were Tania Bruguera, Marielena Hincapié, E.J. Dionne, and moderated by Tom Hall. 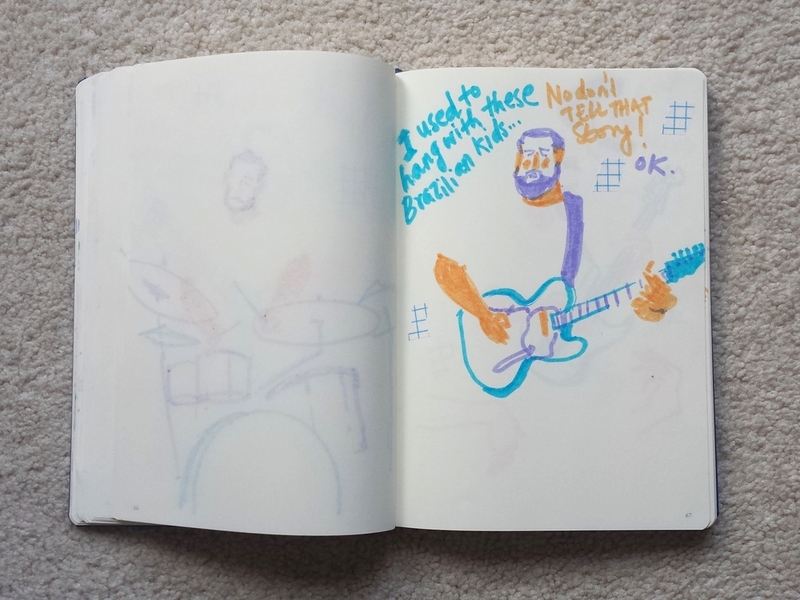 I often go back to my sketchbooks to find reminders to myself of what I have seen, heard, and taken in. This event happened two months ago, but the discourse from it is even more relevant now in light of the results of the US elections, and where the world at large seems to be heading. Here's a peek at the making of The Man with the Broken Leg, written by C.G.Salamander, illustrated by me, for Chimera's The Big Picture. Read the full comic here. Best viewed on phone. A week-ish ago I was surrounded by illustrators, designers, teachers, makers, and thinkers. I was at my first ICON, held this year at Austin, Texas. Conferences can be overwhelming; there are talks to absorb, people to network with, selves to promote. The wonderful thing though, is that there is a kinship that comes from putting hundreds of people from the same field in one place. There is less time spent having to explain explain what exactly it is that you do, what is illustration really. We can cut straight to what matters, and talk about the world we occupy, and our roles as creatives and educators. Teachers and illustrators from North America and Europe presented research papers, new teaching methodologies, ways of catalyzing students, and examining trends in the industry. I skipped all the workshops, except Whitney Sherman's Playing with Silhouettes (which I was assisting), and stayed to listen to all the speakers at the symposium. Engagement was key. Whether it is with the communities around them, the creative industry itself, or with the more academic and critical aspects of illustration, students are being pushed to look outward and interact with the world during the period of their education, rather than after. There was also a general call for the spirit of questioning, and no one said it better than Sabrina Scott. You know you are in good company, when the other person is able to accurately articulate all the thoughts in your head. As illustrators (and designers, artists) we have the power to affect change and thought through what we make. It is crucial that we are aware, responsible and accountable. What Sabrina spoke of is not new, but she backed it up with data and statistics from the last 7 years of award winning American illustration. Was I excited about finding someone who wanted to discuss the intersection between illustration and gender? Goddamn yes. One other presentation stood out for me at the educators Symposium - The Live Comics Project, by Joann Purcell and Martha Newbigging from Seneca College. These two educators created a scaffolded elective, that enabled their students to use comics as a tool to think and understand critically. Illustrators after my own heart. Over multiple sessions, their students read books, essays and the news, and drew comics live at an exhibition of Emily Carr's paintings of First Nations sculptures, and in the process questioned and processed their understanding of indigenous art, appropriation, and curation. They followed this event with another live comics session at a fundraiser for Syrian refugees, again voicing critique on the event itself through their work. Joann was kind enough to give me a copy of the book they compiled from this second live comics session. All of this was of course, pre-conference. Day 2 ended with the actual opening ceremonies, and we could finally see how many people were actually attending ICON. Dancers from Ballet Folklorico took the stage first, followed by Esther Pearl Watson, president of ICON. The evening closed with William Joyce taking everyone through his journey of wanting to be a 'maker-upper' to becoming THE maker-upper. The theme for ICON9 was Tall Tales. It might as well have been High Expectations. The best speakers (and people) not only inspire you to be more, and do more, they also set the bar through their own actions and words. What should we do? What should we be? (Sidebar: Kyle T. Webster said "I gotta be me!" and busted out what needs to be everyone's morning alarms, ringtones and permanent real life BGM). Every other talk was punctuated by panel discussions, some of the more honest segments of the conference. Jessica Hische, on a panel with Julia Rothman and Melinda Beck, spoke at length about managing a business, and addressed the unfair double standards that women in the field have to deal with constantly. Susie Cagle, Darryl Holiday, and Jamie Hibdon shared their experiences of being visual journalists, using live drawing and comics as a medium for reportage. The only section that I was disappointed with was A Global Conversation on Political Satire. Having one European on a panel of white men does not make it a global conversation. The sanest voice I heard during the discussion was one woman in the audience who stood up and reminded everyone to be aware of who we are stepping on in the pursuit of free speech and freedom of expression. Anita Kunz and James Victore book-ended the third day of the conference, between them covering everything all the other talks would say. The beautiful (and expected) thing about conferences is that you are at the least possible distance from your heroes. This time, though, I also met peers who inspired me, who have set the bar in terms of what we need to expect of ourselves as a newer generation of creatives and educators. Antoinette Carroll and Kayla E. spoke beautifully about empathy and action. The short version of these four talks? DO. And BE. Make work, make work that matters, and that makes you feel committed to it. Be the person who says something through their work, own it and be accountable for what you make. Be courageous, move through fear and discomfort. A fitting end for ICON9 was Eleanor Davis, who walked the talk and made her presentation a moving narrative on creation and destruction. Charlene Yi and Jet Elfman were the closing acts, with bittersweet stories, that they read and sang to the audience. No amount of notemaking on my part would capture both these storytelling experiences. They were the tallest tales; the evolving stage design by Jason Holley and his team comes on their heels for a close second. Each ICON tends to have a different voice, I was told. Understandable, since the industry itself is constantly adapting and changing, reflecting in the chosen speakers and topics of interest. I am glad that this was my first ICON, where I was able to relate to and connect with so many of the presenters on a level that I might not have been able to before. Time to jump back into the real world now. Like James Victore said, time to "Let go Kitty". Many thanks to Whitney Sherman for the opportunity to attend ICON9! I still remember one of the questions on my entrance exam for design school - draw a human in relation to one of the listed objects. Easy enough enough in theory. How often are we actually aware of the way our bodies interact with the objects in our lives? How often are we actually seeing, noticing? Concerts are one of my favorite places to draw at. Musicians are rarely still subjects- feet tap, fingers dance across instruments, faces and bodies contort as though music must be squeezed out of them. Musical instruments, almost always a collection of curved surfaces, become extensions of the musicians, moving and swaying with them. Concerts are the perfect places to practice drawing humans with objects. Drawings from an awesome (and long) gig at the Avondale Towne Cinema, GA. Some amazing music by Reverend Justin Hylton, Cicada Rhythm (my new favorite), and Joe McGuinness Trio (with Rafael Pereira and Drew Lloyd). A page from Becoming Rosie is on view at the the MoCCA Arts Fest Awards of Excellence exhibit at Society of Illustrators, NY from May 3 to July 11! The Illustrator is Auteur is now on Facebook! Follow to keep up with updates on new interviews, comics and zines. Becoming Rosie won an Award of Excellence at Museum of Comic & Cartoon Art - MoCCA Arts Festival 2016, for most outstanding work on view at the festival! This is the first comic I made as part of my MFA thesis The Illustrator as Auteur. This fall, I will be teaching a 3 credit graduate level studio elective offered by the MFA Illustration Practice program at MICA. Drawing Nonfiction teaches students to position themselves as journalists, and guides them in building a drawing practice in combination with writing to develop nonfiction narratives rooted in reportage and opinion. Students will experiment with sequential and non-sequential narrative formats. For MICA Graduate and Post-Bacc students only. Login to your MICA portal to register. I have been documenting my MFA thesis project - Illustrator as Auteur - both on my instagram, with process images, and a dedicated tumblr which also includes my thought process during this thesis. Sketchnotes from an Illustration Week '15 talk by Peter Kuper, Frances Jetter, Tom Woodruff, and Steve Brodner, on powerful illustration that is political and personal. MICA's MFA Illustration Practice program is having its annual Fall Show, themed Image Harvest. The idea of Image Harvesting is to look back on previous work to discover key aspects or parts of images that can be regrown into new imagery that can be developed further. My work for for this show, Itinerant is a collection zines and drawings documenting my experiences in the US, in India, and in the airports that I spent time at, in transit between these countries.